"Besides. Traveling with miners, fugitives, pilgrims. " Thus the title of the exhibition, hosted until Sunday, October 9 at the House of Exhibitions in Illegio (www.illegio.it), mountain village of 360 inhabitants: an authentic small casket culture, nature and faith, nestled between the mountains of Carnia, in the province of Udine. The initiative, by Comitato di San Floriano, addresses the theme of journey as purely spiritual experience and taking its cue from the jubilee. "We make a trip to this exhibition that speaks of the trips because travel has always talked about the best humanity's spiritual literature, Sacred Scripture, which tells of the faith as a journey. The inner mobility fits with the spiritual life; on the contrary the inner immobility is the exact opposite of faith. To believe means to get in the way". So the curator, don Alessio Geretti summarized the intent. The exhibition traces the Bible, Greek mythology and Latin, medieval Christian literature and the Divine Comedy, to tell with twists of art the sacred history of human travel, but also has a strong link to current news: among the 38 young guides formed for the occasion (the exhibition will visit accompanied only) there are in fact two refugee, an Afghan and a Pakistani. There are forty-five paintings from the fifteenth to the twentieth century, from thirty collections in Europe and divided into eleven rooms and in five thematic sections. 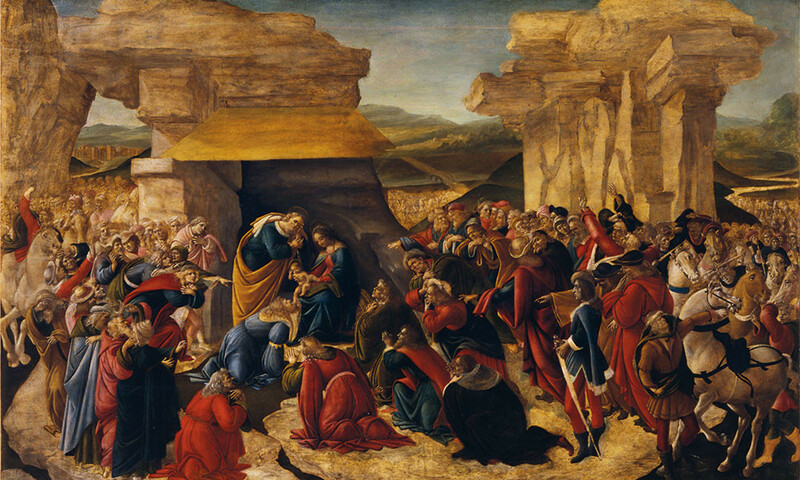 Among these two masterpieces: a version less famous and unfinished Adoration of the Magi, built around the year 1500 by Botticelli and preserved in the Uffizi Gallery in Florence (as the most popular in which the artist has portrait), and a valuable oil on copper depicting The Flight into Egypt (1620), attributed with a certain credibility to the brush of Domenichino and coming from Palazzo Barberini in Rome. Very unusual then Aeneas fleeing Troy (mid 1500) the Veronese Pietro Farinati, not only for the painting technique, it is an infrequent oil on slate, but for the curious way the artist sign himself that, as a talented engraver, used as a trademark drawing of a snail, and especially since the work, coming from the deposits of the National picture Gallery in Siena, was not exposed to the public for thirty years because of its very critical condition. Thanks to organaizers this rarity has been eligible for a restoration in order to be admired again. Share the post "BETWEEN THE ALPS AN EXHIBITION ABOUT JOURNEY IN HOLY ART"